What happens if athletes under perform? Well according to Brian Brady of the Independent 1,800 Olympic hopefuls were kicked off a funding program after falling below personal standards. The World Class Performance Programme (WCPP) guarantees athletes up to £55,000 to cover training costs in the run-up to the London 2012 Games. However the WCPP withdrew 1,800 athletes after they fell below their set personal performance standards. Athletes pulled from the program have to now either gain private sponsorship or work part time to keep their Olympic dreams alive. After having his annual £20,000 funding removed 4x400m runner Richard Buck said: "It's a huge disappointment. I had improved and won international medals". The athlete is now stacking shelves in Tesco to fund his training. While some athletes lost funding through retirement, many have lost their funding because of injury or because they have been judged as underachieving. Between 2009-2013 the funding given to help athlete training has sky rocketed to £264 million, however the increased budget has meant instead of being able to help more athletes fund their training, the demand for better training performances out ruled this. 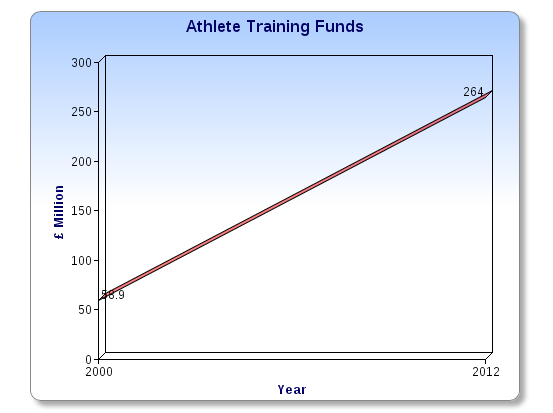 The chart looks at the changes made to athlete training funds between the Sydney 2000 Olympic Games and the London 2012 Olympic Games. However the budget given to fun 34 Olympic and Paralympic sports in the 2012 games is £50 million short of the amount originally considered. This means that 12 sports have been considered as medal "no hopers" and have received virtually no funding.